My Daughter and I had a good time with this kneading the dough. I used the KitchenAid but we kneaded by hand at the end for fun. 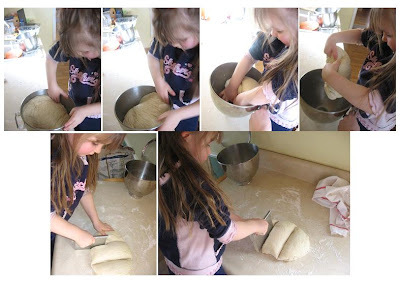 She loved punching down the raised dough and then pulling it out of the bowl. and I think her favorite was making "snakes" out of the dough after I did the pulling and pinching of the dough. the bread tasted GREAT but looked a little rough, but what can you do when a 4 year old is rolling out the snakes. Hubby is asking when we are going to make it again. Thank you Breadchick Mary From The Sour Dough & Sara I Like to Cook for hosting this month's Daring Baker Challenge. I would post the recipe and directions but they seem to be a little messed up at the source. Ok I have been tagged by two people now, Warda at 64 sq ft kitchen and Ashley at Wax Dribbles & Melt Pools so I figure I had better do it. 7 things about me that you would not know. I was an orphan who was adopted by a family when I was 29 years old. My childhood dream was to be an architect and I still dream about it but I know it will never happen, I am getting older you know and I know that I am really good at accounting. I love sushi but hate the California roll. I was homeschooled until I was 15 years old and then started public high school. I am not a fan of homeschooling. I thought that my husband was a conceded jerk when I met him while on a date with his college roommate. I changed my mind about that since then. I went to school to be a Police officer and at the last minute decided that it was not for me, accounting was more my style. In the last few years I have found that I really enjoy yoga, pilates and biking. And from what I can tell I am to pick 7 other bloggers to tag, hummmm lets see I am sure some will not get all goose bumpy over this but I wanted to pick blogs that I read that have not yet been tagged. I had planned on trying to retrace my steps on this recipe and post it; however, it has been 3 months and here it sets so I thought that I would post the photo. Oh yes and I get distracted by the kids and they got a little too dark. Okay so this isn't really a food post but it may change your outlook on how you purchase your food, kitchen gadgets, and computer your using to read this post. Please take the time to watch the video because I think that you will appreciate it when your done. These last few weeks have been so busy with the family getting the flu not once but twice and my statistics class taking more study time then I ever thought I would have to give it. I have not been doing much cooking and that leads to no blogging. Here are a few peeks of what we have been eating around here. Trust me it was nothing exciting, just filling.